Assembled outer cube. One 500mm extrusion was missing the hole needed for assembly, quickly fixed with drill press and 6mm bit. Instructions leave much to be desired and lots a head scratching since several things have changed since they were last updated (taking notes). Current head scratcher is what length M3 bolts to use for the vertical rod holders. Digging through the OnShape design files, I figured out the Z-Rod holders use the M3-16 bolts. The XL300 is pictured with a direct drive extruder setup and that's also what the assembly manual has. 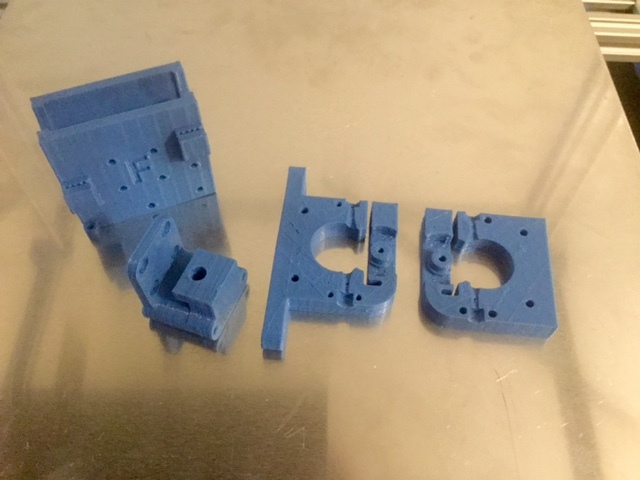 My kit came with a Bowden extruder setup, did they switch? The original Smartrapcore design used a bowden setup. They then decided it didn't work very well and was hard to get working properly and switched to the direct drive setup. Can you post pictures of what you received that makes you say you have a bowden extruder? When I bought the Smartrapcore Alu kit, mine had a bowden hotend with a direct drive extruder. For me, it wasn't a big deal as I just printed a bowden setup and mount at work and had mine working that way. My extruder has the mounting ears for the 2020 profile, I received a long PTFE tube and a push fit, and the J-head mount is setup for the tube. It looks nothing like the parts for the direct drive. I'm trying not to complain until they have a chance to address my emails. But the kit as shipped to me is missing or has wrong versions of lots of stuff and I'm not happy. What I got is missing key parts to even make a functional printer.